If you haven't already seen the news then Roger has decided to part ways with Paul Annacone after a successful 3 year stint together. After a terrific 3 ½ years working together, Paul and I have decided to move on to the next chapter in our professional lives. When we started together we had a vision of a 3 year plan to win another Grand Slam title and get back to the number #1 ranking. Along with many other goals and great memories, these 2 main goals were achieved. After numerous conversations culminating at the end of our most recent training block, we felt like this was the best time and path for both of us. Paul remains a dear friend, and we both look forward to continuing our friendship. I want to thank Paul for his help and the value he has added to me and my team. Does The Split Come as a Surprise? I asked the question whether Annacone should stay or go on in this blog post so the topic wasn't alien to fans but I still think it's a little bit of a surprise. I guess after a disappointing season something had to give and it looks like Roger has shaken things up in a bid to stop his ranking continuing to slide. I'd have thought he'd have waited till the year end but it looks like he's ringing the changes sooner rather than later. I'm unsure as to what the tipping point will have been as no doubt this was on the cards before Shanghai as Annacone didn't travel with him so it looks like the decision was made before the tournament to me and nothing at all to do with the loss to Monfils. I've always been a fan of Annacone after the work he did with Henman and Sampras and from the outside it looked like things were working well with Roger too, after all it's only a year since Roger won Wimbledon and returned to #1 in the rankings. On the flip side a lot of fans thought the relationship had run its course and things had gone as far as they were going to. It looks like they were right. Is It a Good Decision? Only time will tell really, I was indifferent on the coaching thing as I think they can only do so much, once you get out on court it's up to the player to perform and the coach becomes somewhat irrelevant. I do however like the fact Roger is willing to make changes to try and improve his game. Whether he think he needs someone with fresh ideas or goes it alone is up to him really. Obviously we don't know the full story, perhaps it was amicable, perhaps they fell out or perhaps Annacone decided to leave on his own accord; either way it's a change to Roger's setup and does present the opportunity for something new to happen. Will Roger Get a New Coach? There are no names in the hat as of yet, at least in the public eye anyway and it seems to be a 50/50 split of opinion on whether Roger goes it alone or drafts in somebody new. Names like Daren Cahill, John McEnroe and Roger Rasheed have all been mentioned on Twitter but that's all pure speculation. I am definitely in favour of having a coach to bring some fresh ideas to the table and my preferred choice would be Larry Stefanki as I've always been a fan of how he operates. He did a really god job with Roddick and how he played at Wimbledon 2009 was very much down to Stefanki's tactics especially after he beat Murray in the Semi Final. You can see his interview here before that match about Murray – http://news.bbc.co.uk/sport1/hi/tennis/8131843.stm I just like the way he talks and it's obvious they had a plan in place to get Roddick, a player much less talented player than Murray, into the final. And they came pretty close to winning the title too, just Roger was too good as usual. What do you think of Roger's decision to part way with Annacone and who would you like to replace him? Yup, another title, closing in on the leaders. I like this move from Roger, he clearly wants to change things up, he’s a smart man and is good enough alone. Larry Stefanki would be insteresting, Wimbledon 2009 is the classic example of just what a difference he can make, but in the end I think Roger Federer, beeing where he is in his career, is better off just playing naturally. Yeah I like a changeup, hopefully it is a positive move. I think he should get a coach though for sure. Needs some new direction. Hmm dunno man, when his ranking is sliding I’m not sure freedom is what he needs. Gonna take a lot of effort to get back to the top. Djoker Dull and Murray have set the bar high for training intensity. Yes they have, and if Roger wants to get anywhere near the top, he’ll have to be smart about how he trains so as to maximise the gains from the time he spends training. But he’s always got himself for that, and he himself is more valuable than any coach. I’d like to see him try it that way and then assess how things are going. Tactically, against Nadal, Djokovic and Murray in particular, he’s aware of what tactics work in theory, just tha practice is far more difficult of course. I am in doubt this being a ggod idea or not because I like you really like Annacone. But there´s a thing that a change in coach can do, it can get some new eyes on the whole perspective and it can help boost your confidence and for that I think it´s a good idea. And by saying that I have already said I would like Roger to get a new coach. I don´t think Roger being “alone” now is the right thing for him. It has worked very well in the past but there Roger was at a diffeerent stage in his career and riding on a very big wave of confidence. I think he needs that new small input and the feeling of being valued by a new coach who´s also eager to get behind Roger and help him back on track. But who it should be I don´t know, the ones you mention Jonathan are very good posibilities and I personally are a big fan of Cahill but regards to the whole match up I think Stafanki would be best out of them. But there´s a lot of great names out there so it´s going to be interesting to follow all the speculations and rumors following this split between Roger and Annacone. Jonathan you not handing your CV in to Fed, I’m sure he’s accepting through twitter, he’s obsessed with that thing now…Couldn’t believe some of the stuff he tweets, is he really that much of a dork? Yeah I wish he’d stop tweeting really, can’t see the attraction. I wanna know if he has someone helping him run it. I find the whole tweeting thing pretty funny. Strangely enough, I actually think that he is behind it. Better late than never as they say 😀 What do you think to the split? At this point, I think it is a good decision. Hope he takes another coach, but only after doing things his way for a while. I want him to go wild. Just have fun. He should stop trying to please everyone. Its too much pressure. One of the 7 rules of improv is: let yourself fail. But he needs to fail his way. A fresh coach, that gives the appropriate speech is all he needs at this point, IMO. Because there is nothing left he needs to learn. As I said, he has everything he needs to beat everyone. He did it before, but he is trapped in his head. He only needs to beat his self-doubt at this point and a coach can help him do that. Roger’s net game is affected by his confidence, the technique is still there, the mind is not. Coach doesn’t control the player when they are on the court, unless you’re Uncle Toni. I don’t really think his net play has been bad, I’m sure if you look at stats for the last year he’s winning a high % of points at the net. If anything he misses shots by being too casual not by having poor technique. Not sure how Annacone can solve that. Annacone got Roger what he wanted, the number 1 ranking and another slam so I understand that they got everything out of the partnership they wanted. This year though I think it’s pretty evident that what’s happened to Roger has come down to the back injury, lack of matches and lack of confidence. There’s only so much a coach can do in those circumstances. Roger said they talked about this decision during their last training block. I have reason to believe that this came after the US Open loss. Also hearing on RF forum that Annacone was pushing Roger to stick with the prototype but I guess Fed wasn’t comfortable with it after the clay stretch following Wimbledon. I don’t blame Roger for the move, it was coming and it shows that he is willing to adapt to another change in order to get back to where he wants to be. The only thing is if Fed is sorta looking for answers now in a way so I hope he figures it all out soon. Fed has always been a stubborn guy, maybe even Annacone came to a point and said Roger if your not willing to meet me half way I can’t help you anymore. Roger needs a coach that understands the modern game a bit more and really pushes Fed to make the changes Annacone couldn’t: i.e more work on the return. I’m looking forward to seeing if this does help Roger but only time will tell. In other news, I am so disappointed Delpotro couldn’t beat Novak, he was so close, another masters series goes by. Djokovic is unbeatable in China it seems, if Dull doesn’t play until London Novak has a chance to get number 1 back. Be interesting to see if he does change racquets or not now. I would like to see him at least try. Maybe you are right about him not listening and them both deciding the partnership was dead in the water. Del Potro was too emotionally drained from yesterday beating Dull. You could see after the match how happy he was to beat him for first time since 2009. Big win. I don’t think Roger is going to go for a new racquet until he has a winning feeling back and feels as though his game is clicking along with his mentality. Only problem is that is he might never want to go back if he gains momentum with his current racquet. Looking back it’s obvious the back was a catalyst for what has culminated in this season starting pretty early as Rotterdam. Do you reckon Roger should’ve taken that whole stretch off up until the FO? It was obvious that the 7 week break he took after Indian Wells didn’t help much/wasn’t enough? Should he have taken a long break this year and used it not only to heal the back fully and have more time to test the racquet? Yeah if he starts winning with 90 he won’t want to change it ever. Guess we just gotta wait and see, pity we don’t have someone working for the blog who’s also part of Team Federer lol. I tried to offer Annacone £5 / hour via Twitter for intel but he never got back to me. Racquet smash – ZERO, wow after such a dismal 2013 season, he has yet to break a racquet. I would give it A+ he does one. Need to get it out of his system pronto. OK Rog, if you manage to gate-crash WTF this year, I am happy. If not, I hope you take free time to tweak your game for 2014 season. Otherwise I will have to buy a lot of stress balls for next season. I don’t see Luthi as a coach though, more just a helping hand that offers advice, helps training etc. Could do with someone who has experience rejuvenating players and bringing new things to the table. Yeah, Nike done an atrocious job this year and Fed even more so seeing as he’s the one who approves them. Other than AO and Indian Wells have not been impressed at all. They are bringing back gold for WTF though and I always loved the gold from his 2009 Wimby kit so Nike like Roger still have time to turn it around… (that is if Roger even qualifies lol, good kit gone to waste then). I feel like this is a good idea. Needed a change and like he said the goals they set out to achieve we’re achieved and now it’s time for something new. I really hope he gets another coach as I think he’s a bit stubborn to go at it alone. Exciting times though. Allez! The twins might be able to lend some insight. On a serious note, I’m also wondering who he is thinking of at the moment. Do you think he might be interested in a well known player turned coach or even a former player that has never coached before, that could be interesting like Lendl. However, to me it seems Murray/Lendl achieved their dream of Wimbledon so who knows if that one will last. Hard to say, which players have turned into coaches lately? Lendl and Murray won’t last forever I don’t think. I don’t know enough about coaches to be honest. Roddick? Jokes. You could be right, guess we just gotta wait and see and what happens with regards to coach / racquet. We don’t know why they split, or the ins and outs. Maybe it was Fed’s choice, maybe it was Annacone’s. 50/50 Ishld say. Instinctively they both knew cldnt go forward any more. These longer relationships are pretty rare. I can’t see Llendl staying with Andy overly long time now Andy has crashed the party. Toni is different, he is family, they all seem to live together, eat together, no separate lives there at all. Reckon Roger cld take advice from someone like an McEnroe, Agassi, but only on a consultancy basis. Stefanki? Not sure. Bit limited I think, although that may be the Roddick factor influencing my thinking. Thing is, he has to now work out what he needs a coach for. Has fitness(Pag) has shldr to lean on, cry on(Luthi) has management, calming influence( Mirka, Godsick). Needs game tweaks, serve tweaks, tactics tweaks. In fact, Wld say that tactics/ confidences tweaks are key, so who is yr pick? Lubjicic doing good job with Raonic. Rasheed? Too fixed in his views? Maybe he cld make Uncle Toni an offer he can’t refuse!!!!! Haha! He took Roddick with minimum talent to the Wimbledon final and have some of his best years winning Miami in 2010. I guess question marks over whether he can handle someone with as much talent as Roger’s. But Rios was mega talented who he coached. Seems to have done well with a lot of players though – Henman, Gonzalez, Kafelnikov all had good spells with him. Roddick got much much fitter under him too which is why I like his style. Seems to be a good taskmaster and able to employ tactics to get it done. Roger wasn’t kidding when he said this was a transition year huh? 🙂 Based on the year he’s had I guess this was coming in a way. It seems the Fedaconne partnership has run it’s course. To be fair they did what they set out to do winning Wimbledon and in turn breaking record of the total weeks at no. 1. If Annacone has nothing left to impart then maybe the split is for the best. 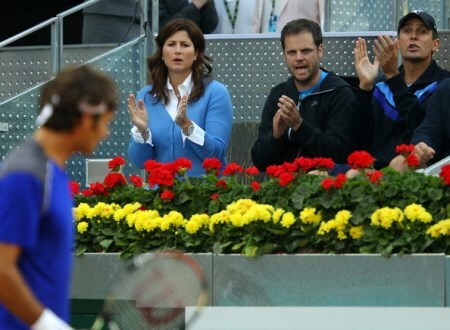 As for a new coach I think Roger should chill with Severin and Mirka for now. One of Roger’s main problems is that he is mentally fragile these days for whatever reason, and I think Mirka can fix that. After Roger lost some close matches in 2010&2011 he said she told him this “She was the one that says: ‘It’s O.K. to lose one or two matches very closely, but you can’t start losing more and more and more. Then maybe something’s wrong in your corner. So you just have to question yourself and check with the entire team, see what everybody thinks.” After that, he went to that tear in the indoor season, topping it off with his win at Wimbledon. Yeah Mirka is the best. But I think the reason Fed went on that indoor streak two years in a row was because he was just pissed off after he lost to Djokovic. with match points. Twice. There’s only so much a guy can take. Fed just needs to get…angry? I’ve never seen Roger so bitchy in a press conference since that 2011 us open semi. Regardless I still think Roger needs a coach in this stage of his career. He still has a slam left in him, with the right guidance and health, another 2012 season is not out of reach. Yeah, I wasn’t really a fan of his attitude in that press conference, but it was understandable :D. I think down the line he will need coach, fresh perspectives an’ all. Agree, said the same thing myself some time back in a post. Mirka is Very wise! Also, the continuing relationship with Paul was always 50/50 after 2012 successes. Sometimes, just a new voice can work wonders. He shld sit tight for a while, get a better hitting partner! Hewitt!! !come on, get into the 21st century Roger! Why oh why isn’t he playing Stockholm or Vienna, needs to be in the saddle, playing matches! Playing by instinct! Seems obsessed with practice! Not sure doing him much good as has to face “live ” balls. Very very different! Raonic has taken a wild card to Stockholm so using on the pressure, as is Tsonga. So wanted Delpo to win today but proof he really is back and hopefully can challenge the top 4 next yr! Yeah surprised he hasn’t bothered playing an extra event. Saving himself for next year I guess. Does he have a good track record? Or just coached WTA? “In January, former top-10 player Marcos Baghdatis of Cyprus scoffed at the idea Mouratoglou contributed much to a player with 14 Grand Slam titles when they started working together. I’m not a fan Mouratoglou either. He is classless. I don’t follow him or his coaching career so can’t really comment on what he’s like. Bagdhatis will be a tricky guy to work with though too I bet, defnitely not the most focused player on tour, too much halloumi me thinks. I read that one reason for the split is a disagreement over the use of the new raquet. PA wanted Roger to use it and Roger wasn’t happy about that. Of course this is hearsay and may be completely untrue, but it left me wondering if the attempt to try out the new racquet in mid-season when he was already in trouble (not the best time to switch) could be partly responsible for his current problems. Lots of people have commented that he sometimes seems confused over shots that should come automatically to him at the moment. I’m thinking that the practice with the new racquet might have interfered with what for Roger after all these years are almost motor skills and had the effect of his partly losing his instinctive skills without having anything to really replace them with. It seems to me the new racquet is a good idea but best tried and perfected when there is time – i.e in the winter break. But I’m not a tennis player – just a fan. Does this make any sense to those that do play? Could be I guess but like you say just speculation. And no I don’t think the racquet testing effected how he has played this in Q3 of the year, it was all about the back. No way 2 tournaments with a new racquet overwrite 15 years of playing with the 90sq” one. His problems were there before Gstaad and Hamburg too really, started right back in Dubai and then Rotterdam long before he tried a new racquet. Some obsession about the racquet here. He has tried out bigger frames before, just not in the public arena. In 2011 he said there is simply not enough off time to try them seriously, and compared to Nadal he is very very fussy about everything, colour( mustn’t distract his vision), weight, everything. Nadal is to his credit, far simpler. There is a great NY times blog about it, will dig it out! Racquet, smacquet! All about inside his head! Come on Mirka, sort him out! Remind him how to win! Sometimes I smell fear out there and that must be eradicated! Far simpler, except for water bottles and other rituals lol. Did I get a wooden spoon or lost it out even? Wow you guys have reacted to the news so quickly! A bit sad surprise…I liked the team Fed with Paul, though it makes sense if you think about it. Their goal was achieved so why not. Change is always a good move when things don’t go well for a while. I think Fed in his mind has written of 2013, looks to be focused on making a run in 2014, I kinda think Jonathan was right that it seems like he isn’t too fussed if he doesn’t get to London. I’m not either. If he doesn’t have good runs in Basel and Paris, losing to top 8 players isn’t going to be the best thing at this stage, needs a time out to reset and get some new goals he can work towards. Yeah I could be right on that dunno guess we see how much effort he puts in for Basel & Paris. Bad tournament in Basel and London will be a write off. I know WTF is a pretty big event but it’s not a players biggest priority. I still think Masters 1000 and Slams are above it. Masters Cup is like an icing on the cake event and completes the resume. I think maybe it was more serious when they played Best of 5 in it too, there’s something about 5 setters that make players take it more serious. Murray obviously not too bothered about it, and Davydenko even won it before too. To be honest I was waiting for this decision since last Wimbledon and I remember that I shared this opinion here. Now I see that I was not wrong. It’s good to see that Rogi is willing to make some changes. Hopefully this is a positive move. I think we shouldn’t underestimate the importance of Mirka as a coach. She was a player herself, she’s watched every single one of his matches (okay – I’m making an assumption about when she’s not traveling with him), she’s been an integral part of his journey. I always remember one announcer – can’t think offhand which match, wasn’t it at Wimbledon, during Roger’s “coachless” years, where there was a rain delay and Mirka found Roger to remind him who he was – “you are Roger Federer” – and the announcer said, “Mirka out-coached (whoever the other guy was)”. I think the idea of working briefly with a series of people on a consultancy basis is an excellent one, and I think Roger should concentrate on people who played longer, older. Have a few meetings with Ken Rosewall. I suspect he’s already had informal ones with Rod Laver. Andre came to my mind too (oldest Slam winner since the Australian was an afterthought, though clearly there are big differences in career arc). Mac has certainly not made a secret of “having some ideas” for Roger, though I’m not sure I see those two personalities making it through more than an hour and a half together. Martina Navratilova would be a great one for him to sit down with & possibly hit some balls with. The problem he solved before was “how do you become your best as a wildly talented but somewhat erratic youngster?” He’s got a new problem now, which is, “how do you stay at the top of the game when many of the rules have changed?” I think he needs to talk to some people who’ve done that. (And I really hope he finds a way to come to terms with a racquet change, because I don’t see how you can stay at the top of a new game with old equipment.) After that, maybe another longer-term coach who’s a great tactician – which is kind of what you’re saying, Jonathan, with Stefanki. I hope he decides to watch some video – not just to figure out what needs to be done differently, but to appreciate what he’s doing right (and from the way he talks, maybe he is). I’m thinking of an Olympic diver who was unable to practice due to an injury, but practiced mentally by visualizing perfect dives, detail by detail, and ended up doing very well in the competition. 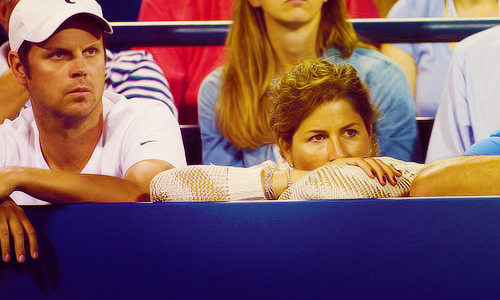 Mirka isn’t a coach though, surely she can’t be a wife, mother and coach. Almost conflicting roles. What about a Gil Reyes bootcamp for Roger? Curious why it’s assumed that Roger wanted the split. My guess is there are challenges for Roger, chief among them being his back, that make long term plans and objectives difficult to establish. While Paul is still young enough to work with travelling pros, it might be the right time for him to move on. Not because he needs a full time commitment (salary-wise) but a longer stretch at developing players. This could very well tie in to his new relationship with Larry Ellison in Malibu. If the fit is right, Paul could do some excellent work developing future American champions. And his old pal Pete is right around the corner to assist. Roger’s never lacked motivation to play or train. What he lacks now is certainty about his physical condition. That and a specific goal. All things change next year (Fall 2014) when his children enter schools locally in Switzerland and the family travels stop. Wish both Paul and Roger the very best. Gentlemen both. Yeah we don’t know, 50 / 50 maybe? Seems amicable from tweets etc. Good shout on the school thing, that will be interesting once they do start full time education. 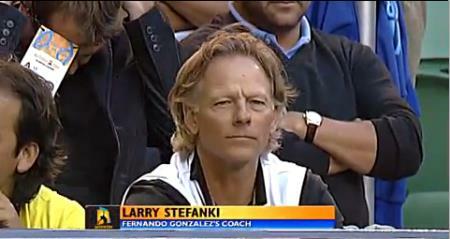 Like Roger Federer’s twins, Larry Stefansky was born on july 23d. One never knows, isn’t it? http://www.atpworldtour.com/News/Tennis/2013/Moet-ATP-Awards/2013-ATP-Awards-Fan-Favourite-Voting.aspx Come on guys vote for Roger. You have to believe what a great and honest guy like Annacone says 🙂 So now, if even possible, I´m excited for the indoor season to start. http://www.atpworldtour.com/News/Tennis/2013/Moet-ATP-Awards/2013-ATP-Awards-Fan-Favourite-Voting.aspx Come on guys vote for Roger….